Luxury Hotel Boating aboard the 5 star Kailani. Canal and River Cruising at its Best. Full Board Holidays Afloat with Skipper and Crew. Includes London Waterways, River Thames, Kennet and Avon, Grand Union Canal, River Lee and River Wey. In May 2018 Visit England announced “We are pleased to confirm Hotel Boat Kailani has been awarded the coveted Gold Accolade due to the quality of fittings, exceptional standard of housekeeping and feedback reviews on hospitality”. 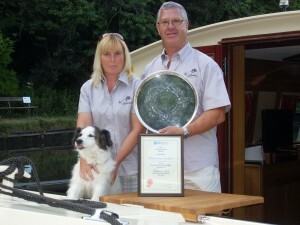 Kailani is the first Hotel Boat to receive this prestigious award. Kailani is the UK’s most exclusive luxury wide beam hotel boat for up to 4 guests in private en-suite cabins. River and canal cruises include the Grand Union and Kennet & Avon Canals, River Thames and the Lee & Stort Navigation and also the River Wey. Kailani is the only Hotel Boat licensed to cruise the Tidal Thames through central London/The London Ring. Kailani fulfills the growing needs of discerning travellers seeking peace and relaxation whilst cruising first class. Kailani has 2 dedicated crew to give guests a 5 star fully catered experience. Kailani achieved the prestigious Lionel Munk Trophy for the best commercially built boat 2013. Awarded at the Inland Waterways Association Festival held at Cassiobury Park, Watford, this also recognises the craftsmanship of the boat builders Aqualine Marine Ltd.
We are proud that the Food Standards Agency has awarded Kailani the highest rating of 5 stars, acknowledging our chef’s hard work in food hygiene, noting that all meals on board are freshly produced. Where possible locally sourced fresh foods and ingredients are used. Kailani is fully licensed for the sale of alcohol. We provide a broad selection of beer, wines and spirits, including champagne. © 2019 Hotel Boat Kailani.